Are you looking to relive the symptoms of a common illness or fighting a serious disease such as cancer? Whichever end of the scale you are at, juicing for health may offer something for you. Some people use juicing to improve their general well being. They often want a healthier life style, more energy or less bouts of common illnesses like colds and flu. Other people choose juicing because they are suffering from a specific illness or serious disease such as cancer. There has been some exciting developments in cancer treatment at the Gerson Institute, and at the heart of their programme is a regular juicing regime. They have proven case studies and research on how their programme helps people that had life threatening illnesses. I strongly recommend that you seek the advice of a qualified Gerson trained practitioner before considering using juicing for cancer. As a major cause of premature death, this disease affects many people and their families. If you are at risk of heart problems you may be interested in how juicing for heart health could help you. Why not take some simple steps to improve your health as you fight this disease? Juicing doesn’t involve heavy drugs or surgery; it’s simply getting into a regime of regularly juicing large amounts of fresh fruit and vegetables. It couldn’t be simpler. The first step is just learning about how to change your dietary habits. It can often be hard to find exact cures or relief from long term illnesses like eczema, as it is hard to pin point the exact cause of this irritating illness. It is also hard to find drugs that can be used on a regular basis without causing even more side effects. 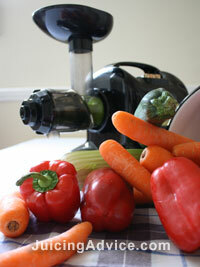 Juicing for eczema has provided relief for some people and may well help you. If you’ve approached the menopause and are looking for relief from some of the embarrassing side effects like hot flashes, you may be interested in how juicing might offer you some relief. Pregnancy is a time of amazing change and development within your body. During this time you might want to think about how an extra boost of vitamins and minerals may not only help you but also your unborn child. Some people believe that juicing for pregnancy is a unique opportunity to feed your baby as it develops in your body. People often look for alternative therapies because they don’t want to use drug treatments or they’ve not had success with these medicines. Although I would never recommend alternative therapies without having first sort medical advice, I do personally know how finding relief from long term illnesses has helped other people and juicing for health may just help you.